Figure 1 – Reconstruction of the former supercontinent of Pangaea and the subsequent breakup in various smaller continents from the Carboniferous to the Quaternary. From WEGENER,1929. So the theory of Continental Drift languished in obscurity from its humble beginnings in 1912 until 1929 when Professor Alfred Wegener was finally able to get a few of his ideas and observations published. Even then only a select few geologists agreed that Wegener's general observations of how the continents perfectly fit together was compelling enough evidence to prove that somehow powerful and poorly understood geological forces were responsible. Finally, in 1959 rudimentary remote sensing observations (Figure 2), specifically magnetic patterns of ocean bottom rock formations, were properly interpreted to prove that the theory of Continental Drift was indeed correct. 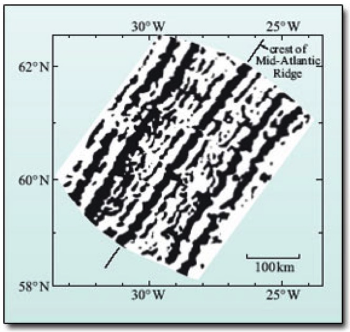 Figure 2 – Sea floor magnetic patterns along the crest of a major pulling apart / “drifting” tectonic plate boundary. It is extremely important to note that the magnetic ocean bottom patterns were not direct / obvious proof that continents drifted sideways. The patterns themselves did not conclusively prove the theory of Continental Drift. What finally turned the tide so to speak was the proper interpretation of these patterns by geologists and geophysicists who dared to think outside the consensus scientific box. They took time to consider how Wegener's general observations might fit together with the new magnetic pattern data. Very quickly, the theory of Continental Drift was proven correct and renamed the theory of Plate Tectonics. Once other “consensus” scientists opened their minds to the theory of Plate Tectonics they found that huge amounts of existing data and observations fit perfectly into the new theory. So after 47 years (1912-1959) the consensus and political blinders were removed. In the same fashion we are now at a cross-roads in considering another theory based on strong general observations that is increasingly being supported by compelling new research data: the Theory of Plate Climatology. General observations indicate deep ocean geological forces are generating: El Niño’s, melting of portions of the Antarctic ice sheet, melting of the Arctic ice sheet, altering the Gulf Stream current, and modifying major climate patterns. To date efforts to get the Theory of Plate Climatology published in the mainstream media, scientific journals, universities and scientific government organizations has met with strong push back. Thankfully the folks responsible for creating and maintaining this site have given the Plate Climatology theory a chance. They strongly believe that science is not about consensus politics or punishing those who dare to think outside the box, rather it’s about fitting the scientific puzzle pieces together into the correct observational and data-supported positions.